Juicy J is a prophet. Bands do, in fact, make her dance. A happy dance. I’m in love with my engagement ring, and I’m even more excited to get a wedding band on this finger. What it will look like, well, that’s still to be determined. Rooster and I recently began shopping for our wedding bands. In his laid-back-dude fashion, Rooster picked his band out in about 2.4 seconds at one of the first shops we went to and bought it on the spot. 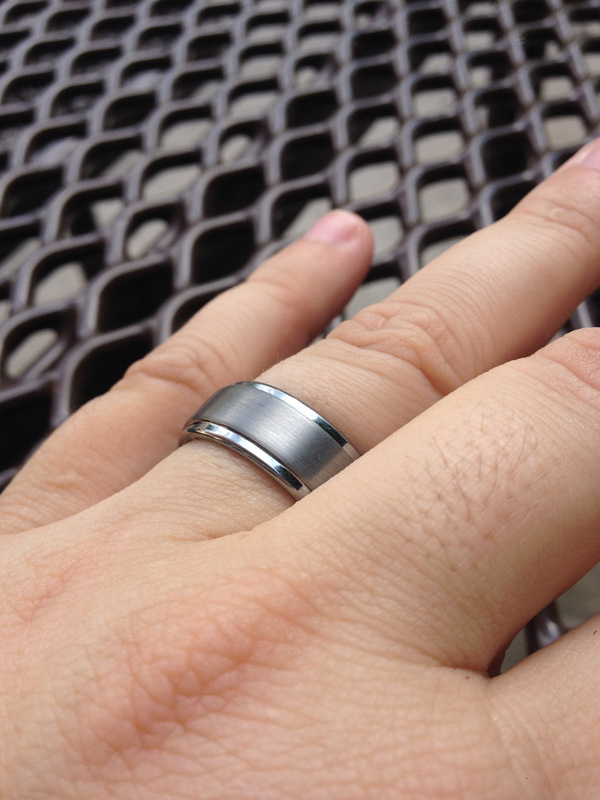 It’s tungsten, and very modern and simple with a little bit of a brushed detail. I, on the other hand, like to take my time (I’m picky) and really comparison shop (so picky) to find exactly the right thing (picky, picky, picky!). 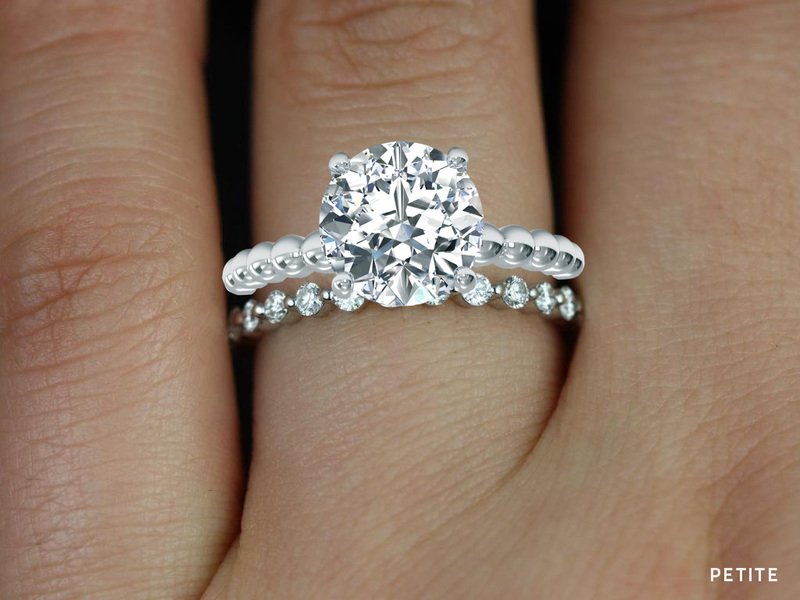 My engagement ring is a simple beaded white gold solitaire. 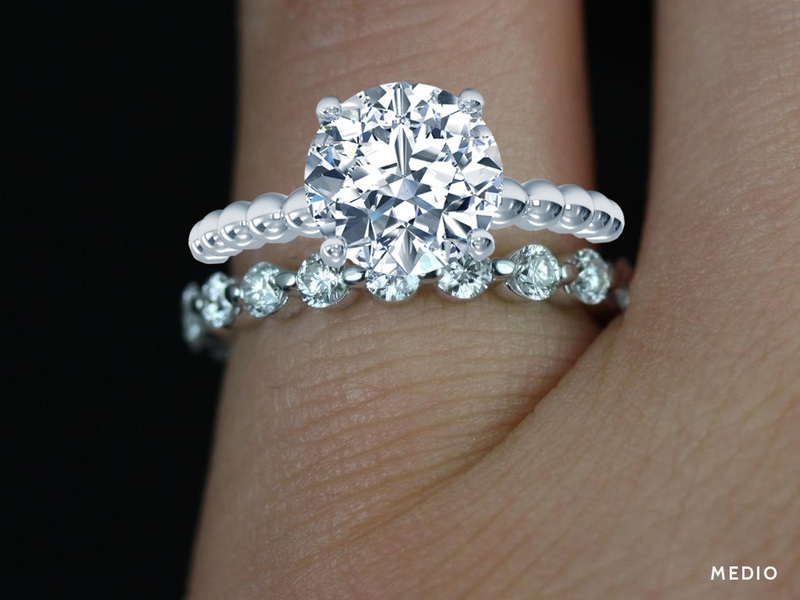 I love that it’s dainty and modern, but my favorite thing about it is the texture. I love my diamond, but I love seeing the white gold beads’ metallic shimmer, too. At first, I thought about going with Ritani’s matching wedding band. It has the same beaded texture as my engagement ring. But after looking at photos online, I decided I wanted something that looked a little mismatched for more visual interest. Just like trying on dresses, I think trying on rings is a surprising experience for a lot of people. 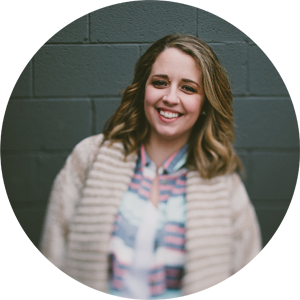 What you wanted when you first started looking might be totally different once you actually see how the different styles actually work on you. If you’d asked me months ago, I would have said I wanted a rose gold micro-pave eternity band (I want a simple band I can wear on its own if I feel like it). But you know what? I tried one on at Kay when Rooster grabbed his band, and I was underwhelmed. It just looked so… boring. I added another ring (a twisted milgrain style) to make a stack, which definitely upgraded my position to a solid “whelmed.” It was lovely (I truly do love a good ring stack), but I didn’t know if it was something I wanted to wear for the rest of my life. So I kept shopping. With no real clue of what I wanted in a wedding band, I was open to trying on everything. Rings with lots of diamonds, rings with no diamonds. Tall rings, small rings. Thin rings and fat rings. I even tried on this crazy pair of rings that each looked like a beaded crown. It was interesting. But it wasn’t my ring. The front runner for a long time was (and might still be) an Elma Gil ring I tried on at one of our first stops. 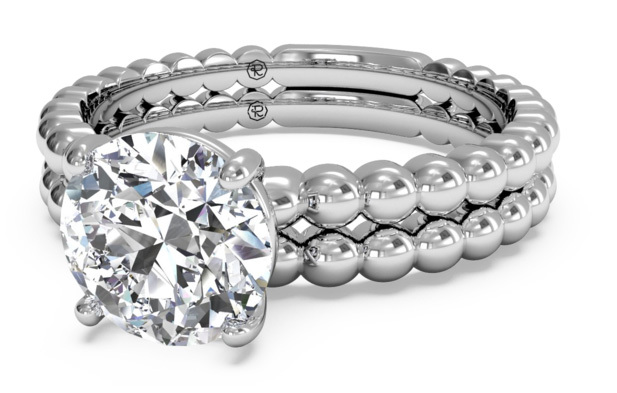 It’s a beautiful band that’s part of an engagement set, and features diamonds separated by horizontal bars of white gold. I loved how the rocks added some extra bling to my left-hand set, and the gold bars played off the beads on my engagement ring’s band. They looked beautiful together, but since I forgot to take a photo, you’ll have to settle for an awkward mockup. It was beautiful, but also a little bit of a splurge for us. In the context of the whole wedding, I’m definitely willing to go over budget on the one thing that I’ll have long after the day is over. But I was confident I could find something I liked for less cash. So I kept looking. Specifically, I wanted to look for a wedding band with baguette diamonds. I couldn’t find any styles I liked in stores, but I had an idea in my head that I wanted to find: An eternity band with baguette diamonds set horizontally, end-to-end. I couldn’t find anything quite like what I imagined. But when a girl has an idea in her head, it’s not easy to change her mind. I reached out to the boards, where @nadnuk came through with a list of links to horizon baguette bands, one of which I really liked. It was from an Etsy seller called Rosado’s Box. After a quick glance around their shop, I found a ton of beautiful, unique wedding bands that I loved (and engagement rings and sets, if you’re a waiting bee). I could gush over every ring Rosado’s Box makes; I seriously think I found my jewelry soulmate. Plus, everything in their line is made in America with recycled metals and fairly traded gems. There’s only one problem: I want to try them all on. After exchanging messages with shop owner Shirley, I learned that Rosados Box is a line started by Love & Promise Jewelers, a brick-and mortar store in Chicago. But without the extra cash or persuasive skills required to convince Roo we need to take a trip to Chicago just to try on wedding bands, I’m going to have to make up my mind on this one without trying them on. And thankfully, we have Photoshop. First up: The Baguettella Horizonal Baguette Eternity Band. This is the one that brought me to Rosado’s Box. I love how horizon-set baguettes are kind of unique, and I think this one could be really stunning in person. 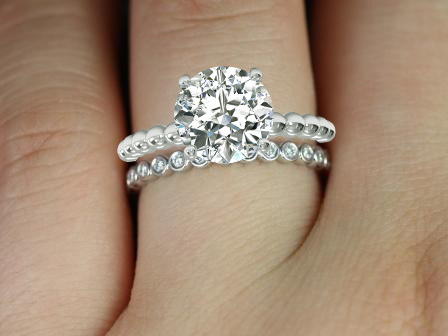 My next love was the Petite Bubbles Diamond Eternity Band. 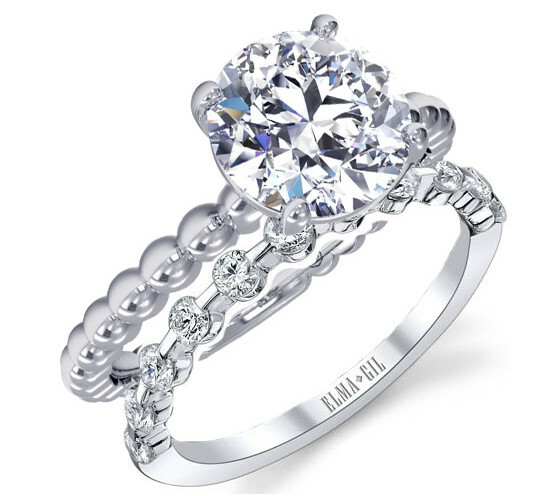 I think the shape of this one could play off my engagement ring really well. It almost looks like a set. Except, I don’t want a “set” at all. 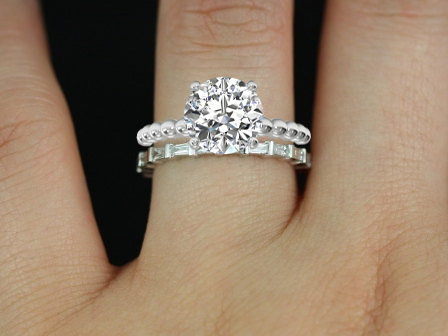 The Photoshops help, but it’s still impossible for me to really know which band is the best fit for me and my engagement ring ( especially since my scale could be way off here). I’m leaning towards one of the Bubble & Breathe rings, but I don’t know which size is the right scale for my taste. And still, I can’t get the horizon baguettes out of my head. And you remember that Elma Gil ring I fell in love with first? Well I still love it. If it were $1,000 cheaper, I would have it on my hand right now. But I think I could love one of these Rosado’s Box rings just as much if I had the chance to see it in person. Like I said before: In rings, as in dresses, you never know what you’ll like until you try it on. Have you ever ordered jewelry online? 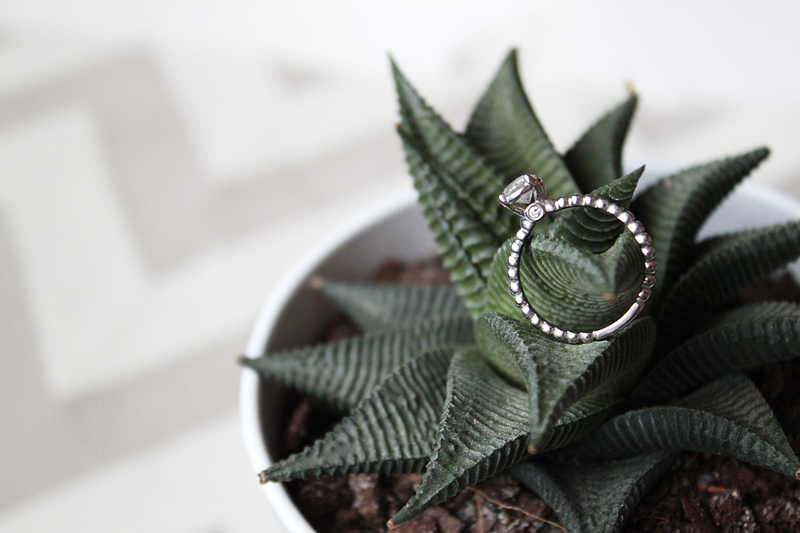 Did you buy a wedding band without trying it on? Any pitfalls or concerns I should have? 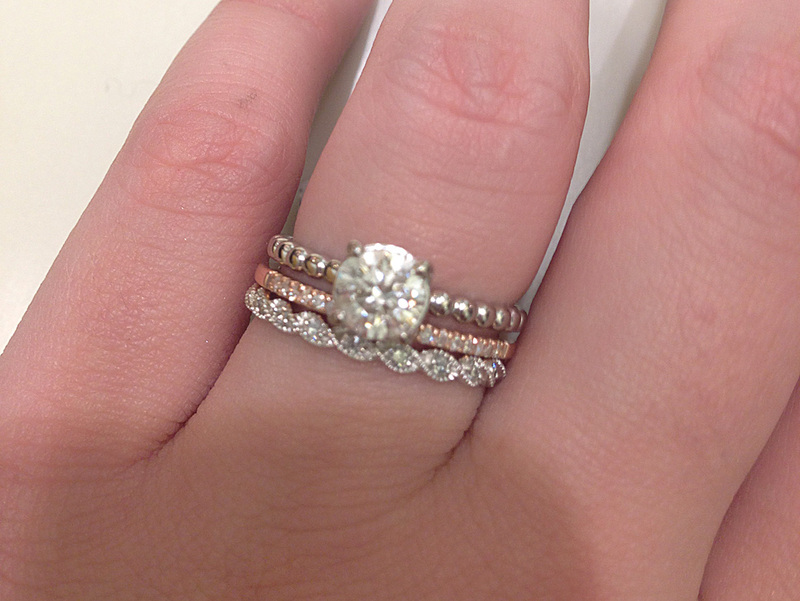 And if you’re so inclined… help me pick a ring!